There is a concept in politics called “framing,” it is one of my favorite strategies. Let me explain. By utilizing framing, you can present any issue in the way you want it to be received. It is like a mind game, that is why politicians do it. Men use this strategy on us women all the time too lol! You can take what would be considered a bad or questionable issue and present it in the way you want it to be received. By using framing, you can steer a person’s thought or opinion on an issue. So, you may ask what does framing have to do with a motivational blog for women in poverty, or women facing challenges who desire life change? The answer is, if you are trying to change your life, you have to re-write the way you tell your story. I have had this conversation several times recently with one of the women I am Coaching, Ethel. She is currently in college and had a couple of essay assignments where she had to discuss a personal situation or challenge she has faced. She has also told her story several times for COTS, the non-profit organization that I work for. She gets frustrated because she feels like people will look down on her for her story, and she still feels bad about it. On the other hand, she often feels like her story is not impactful enough. There are three points in her reasoning that I want to address to help us in our discussion. Telling your story – How are you telling your story? This is where we get to the title of “Flip the Script.” I want you to learn how to flip the script in your life and in the way that you tell your story. Take my story for example. I could present my story as a woman who had a child young, who after losing that child was mentally and emotionally unstable, became a stripper, which is one of the negative expectations of a girl who has a child young, who didn’t finish school in a timely manner, who had two failed marriages because of her past and negative example set by her parents, and who is now again a single parent. That story sounds like a failure, doesn’t it? I don’t want to know that person. She sounds terrible and sad. Now let’s flip the script and frame it in a different way. There was a girl who had a child way too young, but despite that she still graduated from high school. She didn’t let having a child early stop her, and after high school she was working and attending college. Unfortunately, tragedy struck and her daughter passed away. After that, she was emotionally and mentally troubled for years to come. During this time, she became a stripper as a way to support herself. Fortunately, she did not get caught up in “the life” and used this as merely a means to an end. She was able to find her independence as a woman during this time and even enrolled back in college. After two years, she could no longer continue in this lifestyle and changed her life for God and for herself. This young woman spent the next few years working and going to school. She even tried getting married because that was “the right thing to do” and she wanted to prove herself as a decent woman to her family, friends, and the church. She also wanted to provide a family for her daughter with the father of her child. She got married for the wrong reasons and to the wrong person, so the marriage ended, but she now had a beautiful daughter who brought much healing and love into her life. This woman now a single parent, was even more determined to finish college and have a career to support herself and her child. Eleven years after graduating high school, she finally completed her bachelor’s degree. This was a huge accomplishment that she could hold her head high and say that she did all on her own. Now she realized the mental and emotional problems she had, could be changed into strengths. God led her to her first job in the non-profit industry, she quickly learned the field and decided on a career path. During this time, she tried marriage again. Still trying to do the “right thing.” She went against her own desires and married what was supposed to be a “good catch;” only to find that what people say means one thing, often times may mean something else. She also found a pattern, and that is her light was intimidating to some men, the more she accomplished and the stronger she became, the more some people wanted to dim her light. Now enduring a second divorce, while not working and in school full time, she still finished her Master’s degree, and took care of a household on her own. This woman is now 40 years old and a real woman! She has earned her stripes in every way. She is now educated, which she did all on her own. She now has a rewarding career, where she helps other women who are facing challenges and gives them the support and guidance that she didn’t have. She is totally independent, supporting herself with no government assistance. She has found healing emotionally and mentally from her past – healing from her troubled relationship with her mother, her previous negative choices, and her failed relationships. As for relationships, now she knows what she wants in a man, and she will never settle again. She can also now have a healthy relationship…..because she is healthy. Going through these challenges showed her more about herself then a person who had it easy. It showed her how strong she really is, how smart she really is, and she found her power as a woman. She now has a beautiful daughter who she is raising in love, and not following the same negative behavior patterns of her own mother. And the most important thing…..she is now happy, healthy, and whole. Now that’s how you flip a script! How do you feel about yourself? – So remember, I said Ethel still feels bad about her story sometimes? This is the next step. You have to change the way you see your own story. People only have as much power over you as you give them. I definitely had to learn this lesson. Can you image how I felt when I was in the midst of the challenges that I described above? It’s all good now, but boy was it hard when I was in it! Who are you going to let tell your story, the world, or you? I hope your answer is you. I have another question for you, how do you feel about yourself? If you are having feelings of doubt, pain, low self-esteem, these are all normal feelings. However, I want to encourage you not to stay there. The key is to move past these feelings. Do not repeat the same sad story in your head that the enemy wants you to believe. You are NOT a failure. You are NOT a mistake. You are NOT a loser. You ARE strong, and you CAN make it. Here is a bit of advice for changing how you feel about yourself. “Feed” yourself the right mental and emotional foods. Read motivational books, listen to the right music, and surround yourself with the right people. Change what you are putting IN, so you can change what is coming OUT. Your impact – Ethel often feels that her story is not impactful enough. She is comparing it to other people. Comparing yourself to other people is a set up for failure. Women often fall into this trap. We compare ourselves for both the good and the bad. My story is not as bad, or my story is not as good. We can’t win! So, my advice is not to try. Don’t compete with other women, and don’t compare yourself. Just be the best YOU that you can be. When you find your self-value and self-worth, you will know your place in this world. We all have a purpose, what is yours? So, there it is. I have explained what framing means and gave you a personal example of how I flipped the script in my own life. Now what are you going to do with yours? Will you live the life and tell the story that the world has set for you? 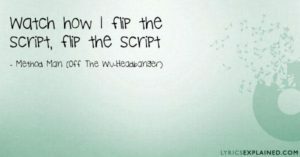 Or, will you flip the script and write your own story? The choice is yours. Yet another on point and powerful piece!